Irresistible IR8224. This knee length full skirted dress features a higher neckline with a collar design. The back of the dress has a v design and bow to finish off the collar. It has a diamante jewelled waistline. Irresistible IR2024 caramel Boucle dress with wrap. Classic dress in boucle fabric for a tweed effect. Dress features cut away shoulders, high neckline fringe detail bottom in a straight cut. Comes with matching chiffon wrap. Wear for the races, wedding, mother of the bride or groom. Irresistible IR8203. Blush mother of the bride or groom outfit with detailed sleeves and bodice in simple tulip shape skirt. Irresistible IR8504. 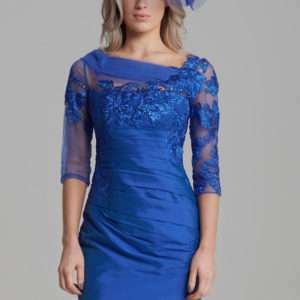 Mother of the bride or groom dress with embroidered lace and sheer sleeve and waist applique detail. Styled with a flattering V neckline in a simple straight fitted shape. Irresistible IR1275 occasion wear or mother of the bride or groom dress. With lace embroidered sleeve and bodice and sheer bateaux neckline with fitted straight fit shape and ruched waist detail to flatter the figure.